As has been well documented, one of my favorite restaurants in past years—not just here in Utah, but in the entire United States—was The Metropolitan. Karen Olson's haute cuisine establishment changed the way many Utahns thought about dining out, and although it's been closed for a couple of years now, its effect on our cuisine—via the chefs and others who labored there—is lasting. So I was a tad surprised when Olson reached out to tell me her latest restaurant venture was a sandwich joint. Would there be a foie gras sammich? I wondered. Well, not exactly. Olson has always been keen on making her community better, and now, she's helping to feed those in need. Serving as project manager, Olson teamed up with founder/entrepreneur Steve Down (Financially Fit for Life, The Falls Event Centers, Miracle of Wealth, etc. ), social media director Sara Day, marketing director Jamie Coat and others to create Even Stevens Sandwiches. Thanksgiving seems to be an especially fitting time to call attention to the work that Even Stevens is doing, as it's a time when many of us gorge ourselves on holiday fare, while others can't be sure where their next meal will come from. Maybe it will come from Even Stevens. The basic idea is a simple one: For every sandwich sold at Even Stevens, another is donated to local nonprofits helping to end hunger. It's not exactly a one-to-one affair. That is, when you buy a Reuben sandwich, you're not buying that same sandwich for a homeless person. It's a bit more streamlined: Food accounts are set up by Even Stevens for the nonprofits it serves. Then, at the end of each month, the number of sandwiches sold is tallied, and an equal amount of bulk sandwich ingredients—turkey, cheese, bread, condiments, etc.—is delivered, and volunteers are rallied to "build sandwiches and spread the love to individuals in need," as Even Stevens' mission statement puts it. Sadly, there is no shortage of individuals in need. According to Utahns Against Hunger, 1 in 6 households in Utah struggles to afford enough food. Statistics from the Utah Food Bank say that 1 in 5 Utah kids are unsure where their next meal will come from, and 444,000 people—16 percent of Utah's population—are food insecure. The bottom line: Buying a sandwich at Even Stevens helps. While the business model and charitable efforts behind Even Stevens is admirable and should be saluted, this is also a for-profit business, selling products to consumers just as places like Subway do—albeit with much better karma. So, how does Even Stevens stack up strictly as a sandwich joint? Even Stevens is a funky, hip place full of millennials (their term, not mine). There's definitely a "do-gooder" vibe alive and well, but I have to say that enthusiasm isn't always a substitute for competence. I've yet to visit Even Stevens when there wasn't a service glitch of some sort. During a recent visit, my wife ordered the Goat Getter salad ($7.95), which the Even Stevens menu says contains "spinach, arugula, grilled goat cheese, cranberries, toasted almonds and tangy house vinaigrette." I couldn't detect anything "grilled" about the goat cheese crumbled on top of the greens. But more importantly, neither of us could suss out a single leaf of arugula. When we asked about that, an employee informed us that "spinach and arugula look alike." Well, yes, sort of, but I'd stake my reputation as a food writer that there was no arugula in that salad. But I like the sandwiches I've eaten at Even Stevens. The Sloppy Tina ($6.75) is a spot-on vegetarian version of a sloppy Joe, made with mushroom and chickpeas in a zippy tomato-based sauce. Had I not known what was in it, I could've been fooled into thinking I was eating meat. There is also a meat lover's sloppy Joe ($6.95), a slow-simmered combo of beef and chorizo topped with pickled red onions and served on a Kaiser roll. There's a faux pot roast sandwich on the menu, too, that is remarkably tasty. The pot roast dip is made with braised turkey "pot roast," Swiss cheese, red onion and jalapeño jelly on lightly grilled sourdough slices. Sadly, the au jus that came alongside was thin and watery—definitely not a worthy partner for that super sandwich. The turkey noodle soup I tried was so-so. I've tasted the same flavors before, from a can. Normally, locally brewed beers and mimosas are offered, along with sodas, juices and such, but the operation currently can't serve beer because someone forgot to renew the license with the DABC. Breakfast items fare much better. Who wouldn't love Even Steven's stuffed French toast: two slices of raisin-walnut French toast with a layer of banana-cream cheese filling in between and berry compote on top ($5.95)? 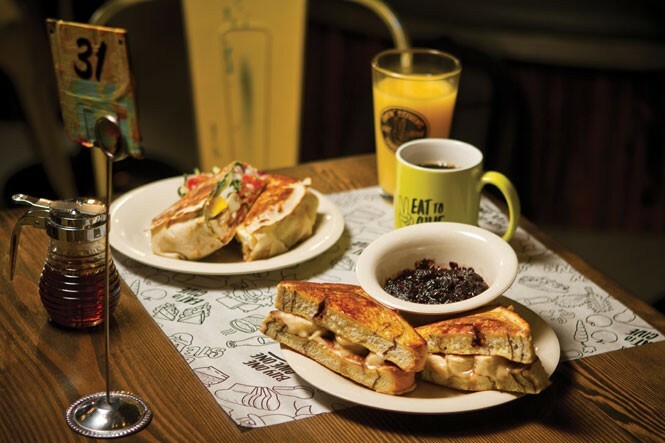 There's also a killer breakfast burrito called the Graduate, with two eggs, a choice of bacon or sausage, cheddar cheese, spuds, onion, tomato, spinach and Russian dressing. What a way to begin the day! From a consumer point of view, I'd have to say that, considering the $7 to $9 prices, Even Stevens sandwiches are a bit on the skimpy side—definitely not overstuffed. But then, we must remind ourselves that when we're purchasing a sandwich at Even Stevens, we're really buying two of them: one for ourselves, and another for a hungry stranger.